Hello once again! Here we have a 32x32 forest tileset with some grass/undergrowth, a tree, a forest, a cliffside and some various odds and ends. It comes in both a dark version and, by popular IRC demand, a somewhat lightened version. Feel free to make your own coloration! 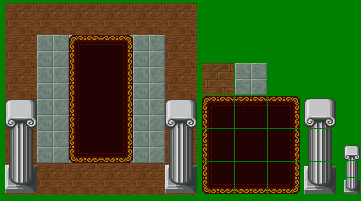 Also included are a few interior tiles I did as a test. These tiles were comissioned by Gaurav Munjal for his awesome HTML5 Canvas Old School RPG, which you can see at http://gaurav0.github.com/Old-School-RPG-Map.I definitely suggest you check it out. As part of CC-By, please link back to this page. They look great. Look forward to seeing them in-game. @manwesulimo2004 You can see it in-game now. Just go to the forest dungeon. You may have to hit reload if you have played the game before. Cool. Is there going to be a dark battle background to go with the dark forest tiles? You absolutely may. As long as you give attribution as specified you can do whatever you please with these tiles. I would appreciate it if you released aany modifications you do under the same license, but this is not required by the license. That said, I have been planning to update these tiles in the furutre, and I've already done some work on the tree. I dont know when that will be done, though. Really magnificent!!! I favorited it!!! But I prefer to make my own textures. How is it I never found this, even with all my digging through your stuff on OGA for enemy sprites? Lovely work as always.